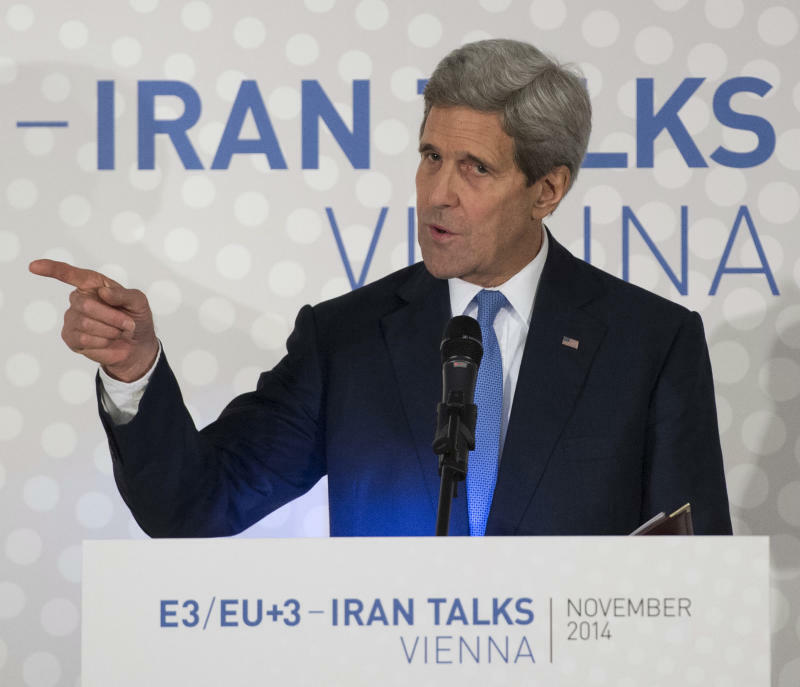 Vienna (AFP) - US Secretary of State John Kerry on Monday defended extending a deadline for a nuclear deal with Iran, saying "real and substantial progress" was made in talks in Vienna and calling on US lawmakers not to impose new sanctions on Tehran. "We have made real and substantial progress," Kerry said in Vienna following nearly a week of talks involving six world powers and Iran. The parties said they would miss a Monday midnight deadline for a deal and extend the negotiations until July 1 next year, working on the basis of an agreement struck a year ago that curbs some of Iran's nuclear activities in exchange for limited sanctions relief. "This is certainly not the time to get up and walk away... We look for your support (in Congress) for this extension." Republicans warn President Barack Obama is being fooled by the new, more moderate face of the Islamic republic, which it claims aims to win billions of dollars in sanctions relief and will still covertly seek to develop a nuclear weapon. Legislation is already pending before US lawmakers that instead of lifting sanctions would impose even harsher ones. But Kerry added: "We would be fools to walk away from a situation where the breakout time has already been expanded rather than narrowed and where the world is safer because this program is in place." The breakout time is generally taken to mean how long Iran would need, were it to choose to do so -- and it hotly denies such an aim -- to produce one bomb's worth of fissile material. Kerry conceded the negotiations over the next few months would not be any easier just because there is an extension. "They're tough and they're going to stay tough," he told hundreds of reporters crowded into a tent outside the 19th century palace where the talks took place. But he said "today we are closer to a deal that would make the entire world, especially our allies and partners in Israel and in the (Arab) gulf, safer and more secure."